We now know of a potentially habitable planet five times the size of Earth that has existed for more than twice as long. A mere thirteen light years away, Kapteyn b is now the oldest known possibly rocky planet in a habitable zone. This 5-Earth-mass planet orbits swiftly: once every 48 days around its parent star. Kapteyn itself is no slouch: it flies across the sky faster than almost any other nearby star. The whole system-Kapteyn's star with its two recently discovered planets b and c-is a long way off from where it first formed outside our galaxy.Discovered in late 1890's by the astronomer and cosmologist Jacob Cornelius Kapteyn, Kapteyn is an M1 red dwarf: a cool, small star—the most common type of star in our Galaxy. While our Sun is between five and six thousand degrees Kelvin at its surface temperature, Kapteyn's surface is more like 3500 degrees K.
In addition to being cooler, Kaptyn is also less massive: about 1/3rd the mass of the Sun. Also in contrast to our 4.6 billion year-young Sun, Kapteyn's star is likely quite a bit older. Kapteyn is thought to be a member of an ancient group that formed in the early days of the Universe. These primordial stars now live in a halo just beyond the inner boundary of our galaxy. The halo objects, some of which are up to 13 billion years old, have been yanked across the sky to their present positions by cataclysmic galactic merging events that began in the early days of the Milky way. This forced migration continues to affect their behavior. Kapteyn's star is flying away from us at 245 km (152 miles) per second. It is also moving across the sky so quickly that in 3500 years it will leave the constellation Pictor and enter Dorado, the next constellation to the southwest. Because of its temperature and speed, Kapteyn is known as a high-velocity, low-luminosity halo star. These M dwarf stars make great targets in the hunt for exoplanets. We can, quite literally, watch them walk across the sky. Planet-hunting using doppler shifts has improved to the point where we can measure the speeds of these particular stars to the one meter per second level: which corresponds to walking speed. 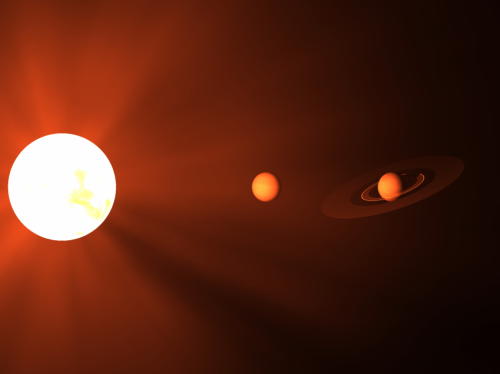 As a result, we can detect exoplanets a little larger than our own around nearby M class dwarf stars. Kapteyn b is just such an exoplanet. Kapteyn makes an even better target than most because it is so incredibly close. 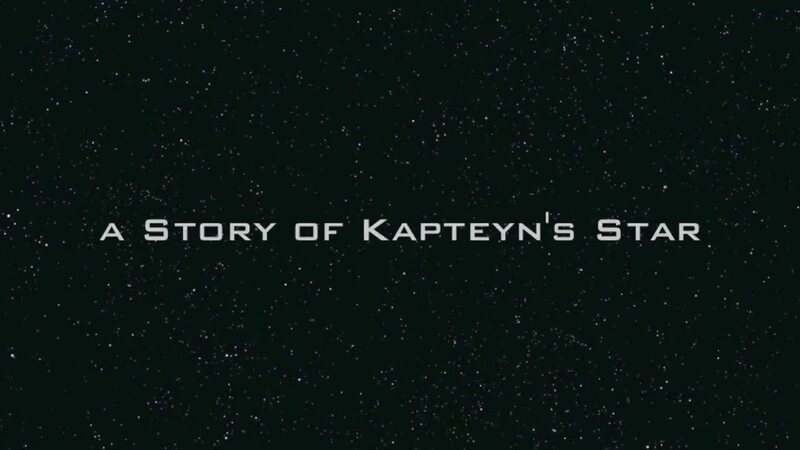 There are only two-dozen stars closer to us than Kapteyn. It is by far the closest of all the halo stars. Even so, twenty astronomers on three continents combined ten years of data from three large large telescopes to resolve the Doppler signals that we are now calling Kapteyn b and c, orbiting with periods of 48 and 120 days, respectively. 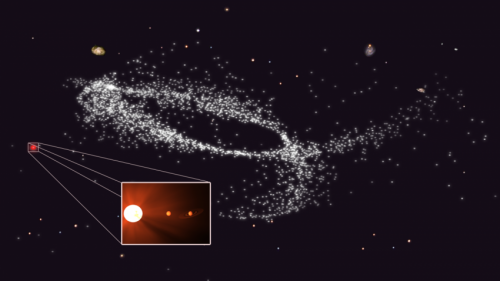 "We were surprised to find planets orbiting Kapteyn's star," said lead author Dr. Anglada-Escudé from Queen Mary University of London's School of Physics and Astronomy. "Previous data showed some moderate excess of variability, so we were looking for very short period planets when the new signals showed up loud and clear." A closer-in view: An artistic representation of a low-mass star with two planets. Orbiting around the low-mass star Kapteyn, the terrestrial planet Kapteyn c is estimated to have five times the mass of Earth. It rotates in the habitable zone around Kapteyn every 48 days. Further out from the parent star, Kapteyn c orbits every 121 days. Credit: Copyright, University of California, Irvine. Used with permission of the Queen Mary University of London press office. Of the two, Kapteyn b is the only one in the habitable zone. Kapteyn c, with at least 7 Earth masses, may be a rocky body as well, but astronomers suspect it is too far from the dim red dwarf surface to have liquid water. It remains to be seen is if the atmospheres of either of these planets contains water. Before knowing for certain, astronomers would need to see the planets pass directly in front of their parent star. "We are interested in nearby stars because if we can find transiting candidates around them, these are bright enough that we can attempt characterization of their atmospheres," said Anglada-Escudé, "The race is on in the search for a transiting planet in the habitable zone of a nearby star." Though observing a transit is pending, we have already seen something extremely important: the fact that both of these planets seem to have small masses. This is consistent with a theory of planetary formation, which states that stars low in metals, like Kapteyn, should breed low-mass planets. This gives us further reason to focus our search for Earth-analogs on certain types of stars. Because of their advanced age, their tendency to form rocky planets and the high precision we have achieved in measuring their velocities, red dwarfs like Kapteyn will continue to be objects of interest for planet-hunting astronomers and astrobiologists alike. This is especially true for objects in the galactic halo, which is home to the oldest known star in the Universe: HD 140283, discovered last year and estimated to be as old 14 billion years. Newcomers like our Sun formed much later on in the disk. The Earth, the home of every form of life currently known, is only 4.5 billion years old. Said Anglada-Escudé, "It does make you wonder what kind of life could have evolved on those planets over such a long time." At 5 Earth masses and so ~2+ Earth radius assuming the same density, it is too large to be a likely habitable who at the current observational range close to stars have a 1.7 Earth radius cut off. But we already know that there will be some exceptions, because we have found a 17 Earth mass non-gas giant, a core without core accreted gas as it were. In fact, I think the HEC places it in the middle of the current ESI ranked habitables. That doesn't exclude observation, and since it is the closest halo star I'll bet it will be thoroughly investigated anyway!